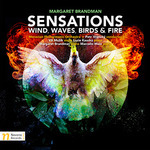 Sensations : wind, waves, birds & fire / Margaret Brandman. Binna burra dreaming : for violin and piano / Margaret Brandman. Binna burra dreaming : for 'cello and piano / by Margaret S. Brandman. Binna Burra Dreaming is a contemporary, yet listenable work. The title of the work is taken from the aboriginal name for 'where the beech tree grows'. The work is in one movement and through-composed in several sections in various modal minor tonalities and varying time signatures. The piece begins with a cello (or violin) figure representing the sound of a digeridoo chanting 'binna burra'. The 'beech tree grows' motif appears throughout the work in different guises. Apart from the melodies, there are intriguing rhythms and contemporary jazz harmonies. Commission note: Commissioned by Duo Deconet. 23 Aug 2014: at Rhapsodies to Rhumbas (Zenith Theatre Chatswood). 9 Nov 13: 'Rhapsodies to Rhumbas' concert, Joan Sutherland Performing Arts Centre, Penrith NSW. Featuring Duo Deconet. 9 Nov 2013: at Margaret Brandman: Rhapsodies to Rhumbas (Joan Sutherland Performing Arts Centre).